This is a sponsored by Global Influence with product provided by Hershey’s. Regardless, all opinions are my own! What would Halloween be without the candy and costumes? Just another day! This year, Hershey’s has made sure that our home will be THE place to Trick or Treat with tons of delicious Halloween candy! Kit Kat (Snack size) – this popular treat is covered with white chocolate and then colored orange for a special Halloween treat! Rolo’s (Snack size) – these mini packs of Rolo’s are perfect for Trick-or-Treats! 3 per pack. Jolly Rancher Caramel Apple Lollipops – these are a new one to me this year. Each lollipop combines the flavors of sour apple with buttery caramel. Yummy! Scream Eggs – these are the beloved Cadbury Eggs with green yolk for Halloween! Reese’s Peanut Butter Cups (Mini’s) – the all-time favorite candy has shrunk to fit into individual packs. 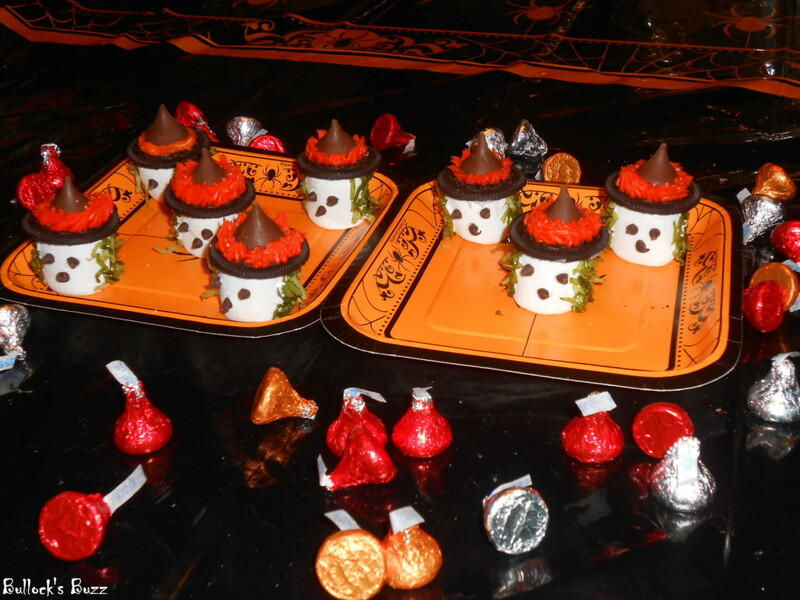 York Peppermint Patties – pumkin-shaped and dressed in silver and gold wrappers. Kit Kat Halloween Bar – Hershey’s has 4 special edition Kit Kat designs this year. We received two of the Spooky Bat design as shown in the photos below. 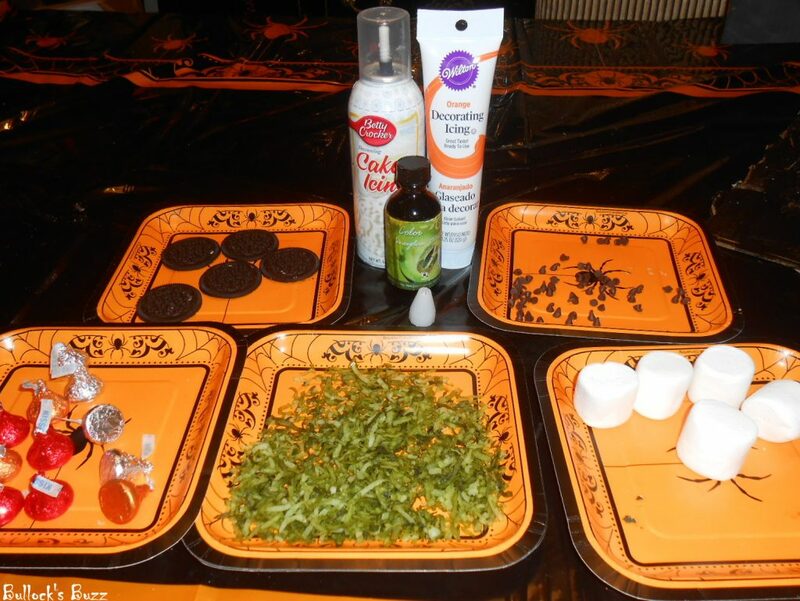 With all this candy, I just had to make some Halloween crafts and treats! Each year Hershey’s gives new treats and old favorites an eerie new look for Halloween. They concoct Kit Kat’s with white chocolate and color them orange, and York Peppermint Patties become pumpkins with shiny orange wrappers. Original Kit Kat’s get limited edition wrappers, while Hershey’s Kisses and individual Rolo’s are wrapped in gold, red, silver and orange. Other Rolo’s are made into tiny packs of three, and everyone’s favorite Easter treat, Cadbury Cream Eggs, become Scream Eggs with green yolk! And all time favorites like Hershey’s Milk Chocolate bars, Kit Kat’s and Reece’s Peanut Butter Cups shrink to a miniature size. With all of these Halloween changes, I figured, why not take it one step further; everyone else is dressing in costumes for Halloween, why not give the candy a Halloween costume too?! 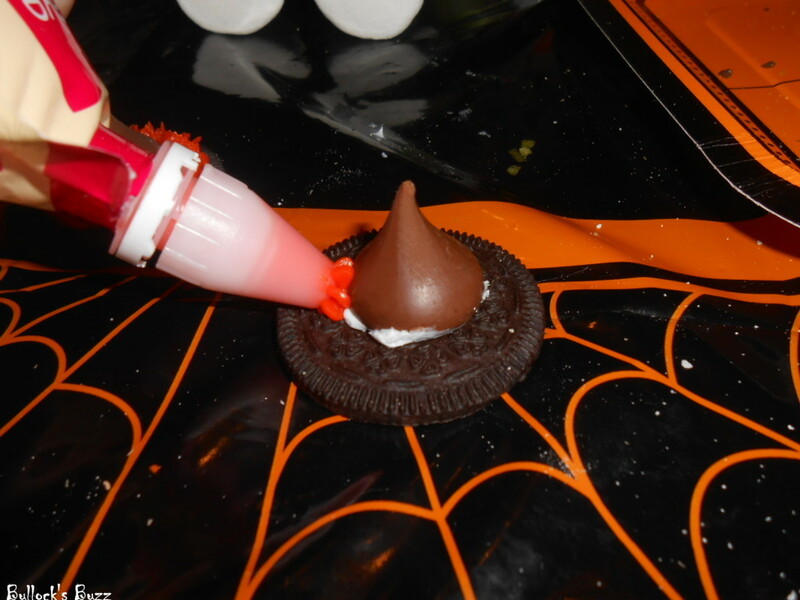 Below are a few fun ideas for turning your candy into spooky treats. 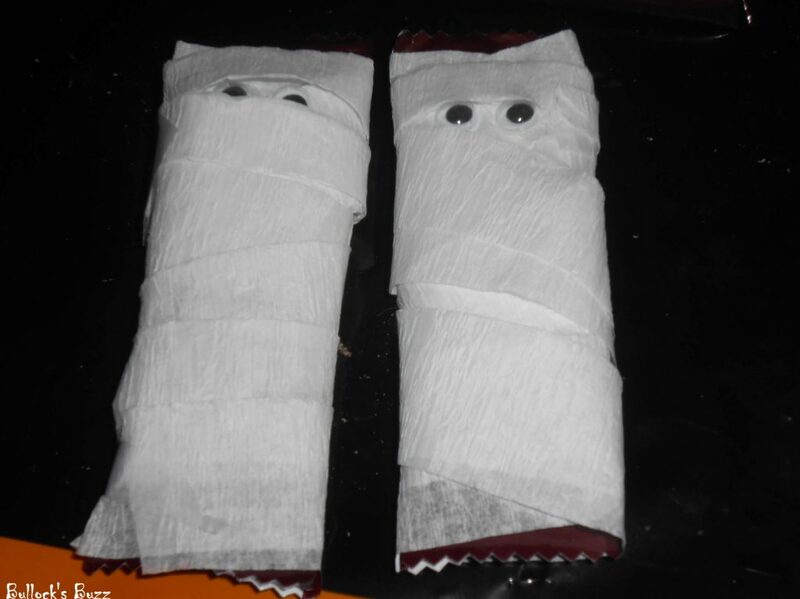 For these spooky Candy Bar Mummies all you need is a few supplies and a couple of minutes. It is a quick, fun and inexpensive craft you and the kids can do together. I had glue at home, the candy was provided by Hershey’s, so the entire project cost less than $3 as the streamers were .99¢ and the Wiggly Eyes were $1.35. You will need white crepe paper (streamers), wiggly eyes, glue/tape and a bag of snack size Hershey’s Milk Chocolate Bars or your favorite Hershey’s candy bar. Once you have that, gather the family around and get started. Begin wrapping the chocolate bar from bottom to top, crisscrossing as you wrap. Secure the end with tape/glue, then add two eyes and that’s it! Another cute way to dress your candy is using construction paper and wiggly eyes.  I found this idea on the Women’s Day website, and it took very little time and was lots of fun! 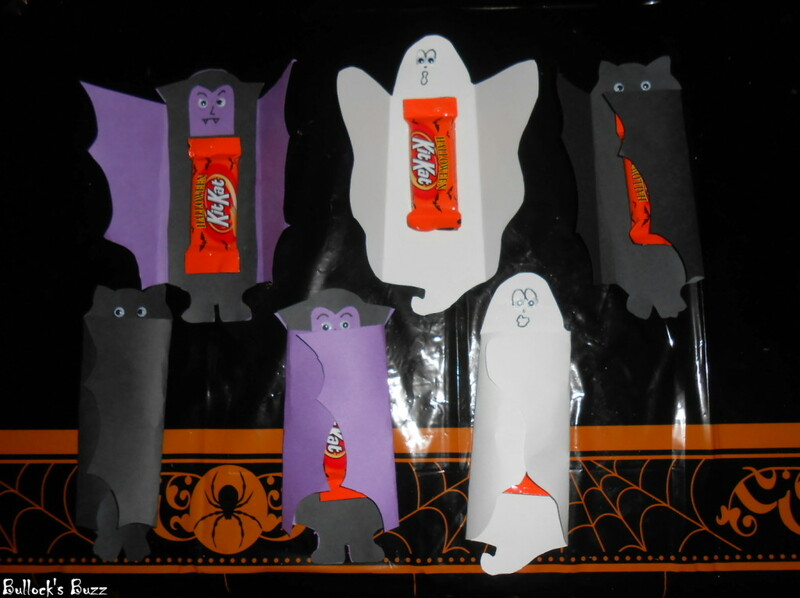 All you need is black, white and purple construction paper, a black marker, glue/tape, scissors and snack size Kit Kat candy bars. Using the templates listed below, trace and cut out each design on construction paper. Next glue on the googly eyes, and add facial features using the black marker. 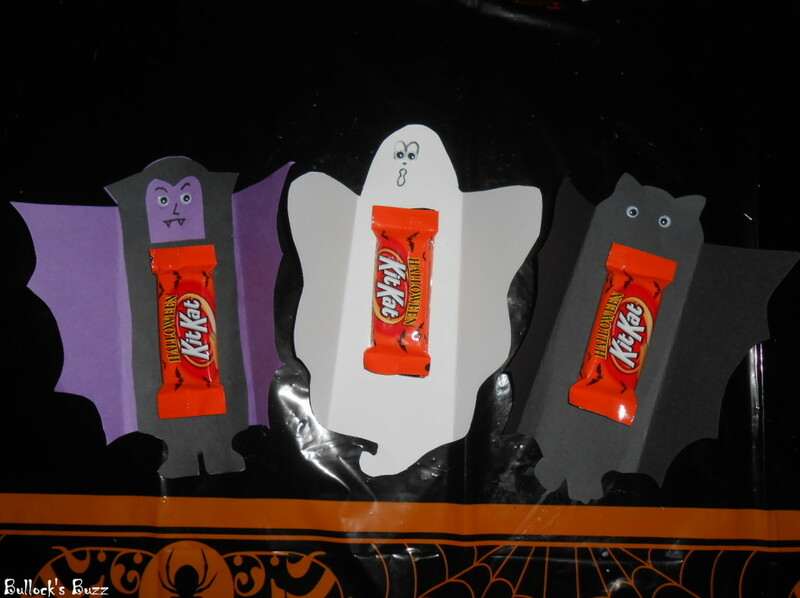 Then tape the candy bars onto the center of the cutouts. Finally, fold the paper up and fasten with a glue dot or small piece of tape so the children can easily open it up. Here is another fun-to-make treat, one both you and the kids will love to eat. So gather the kids and have some fun! A few months ago I came across this adorable craft in Taste of Home, and couldn’t wait to try it this Halloween. It is incredibly easy and perfect to do with the kids. You will need a bag of large white marshmallows, Hershey’s Kisses, white frosting, orange frosting in a tube, a star tip for the frosting, a bag of coconut, green food coloring and a bag of miniature chocolate chips. 1. 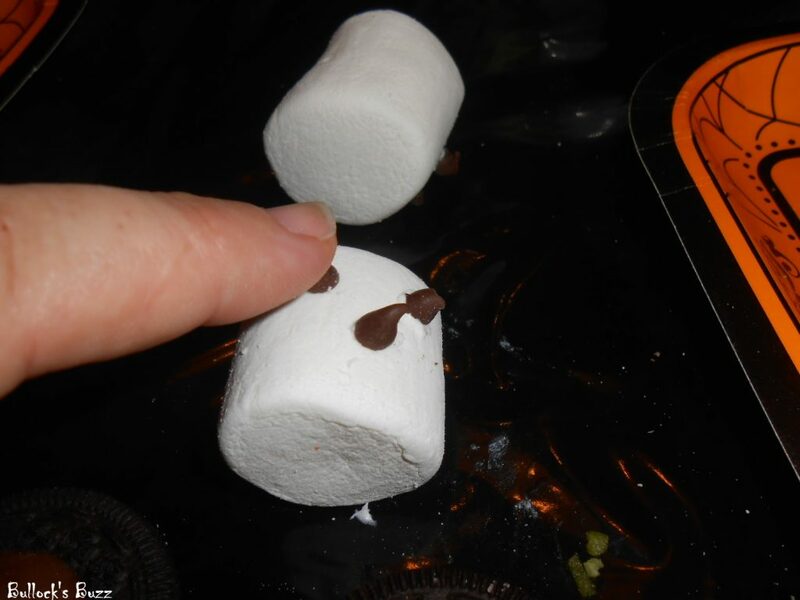 For the face of each witch, place a dab of frosting on the bottom of three chocolate chips, then press two for eyes and one for nose onto each marshmallow. 2. 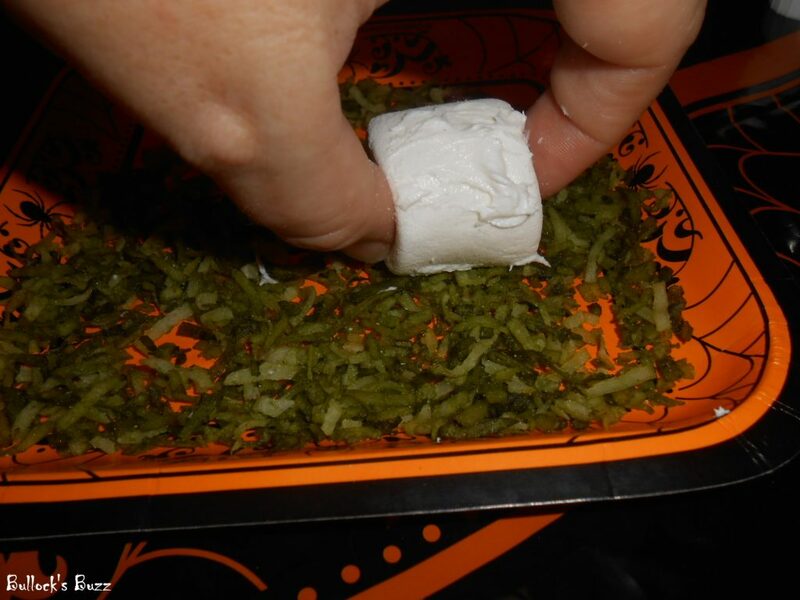 For the witches hair, mix a few drops of green food coloring and a drop of water in a small resealable plastic bag; add coconut and shake well until the coconut is completely covered. Pour out onto a paper plate. 3. Spread a small amount of frosting on the sides and back of the marshmallow and dip the frosted sides of the marshmallow into the coconut hair on the plate. 4. 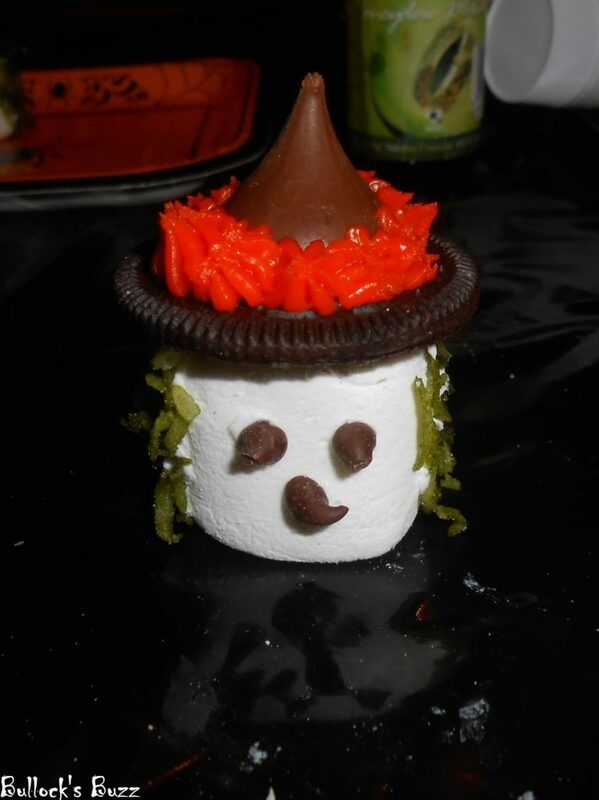 For the witches hats, spread some frosting in the center of a chocolate wafer and press on the Hershey’s Kiss. 5. 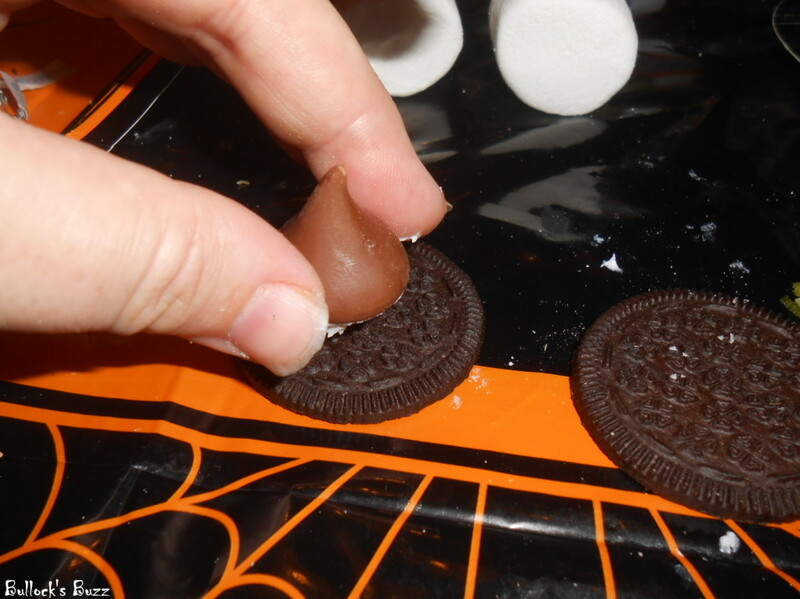 Using the orange frosting with a star tip, pipe stars around the base of each Hershey’s Kiss. 6. Place the hat on each witch using a dab of frosting to secure. 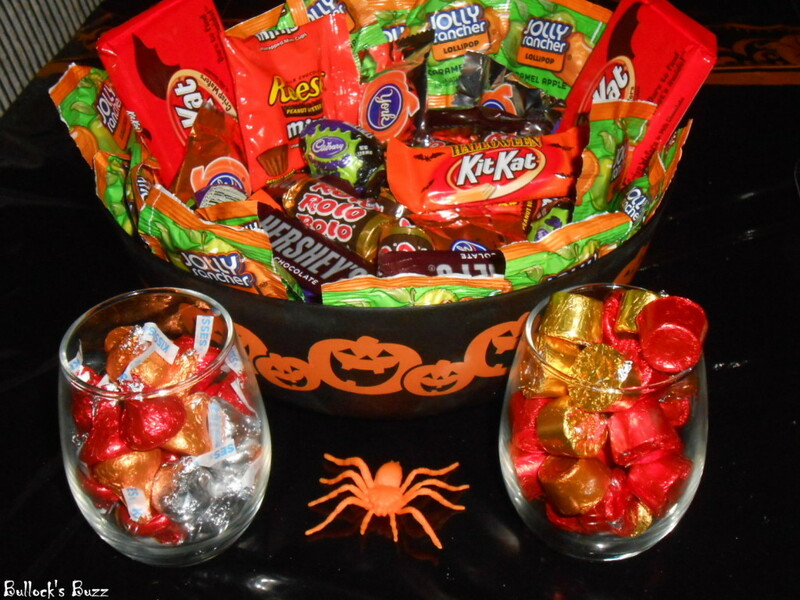 For even more fun Halloween ideas including recipes, crafts, party ideas, costumes and more, check out Celebrate with Hershey’s, an awesome website where you can find so many creative ideas for each holiday and special occasions. And be sure to connect with Hershey’s on Facebook, Twitter and Pinterest for even more great ideas, promotions, deals, and contests! 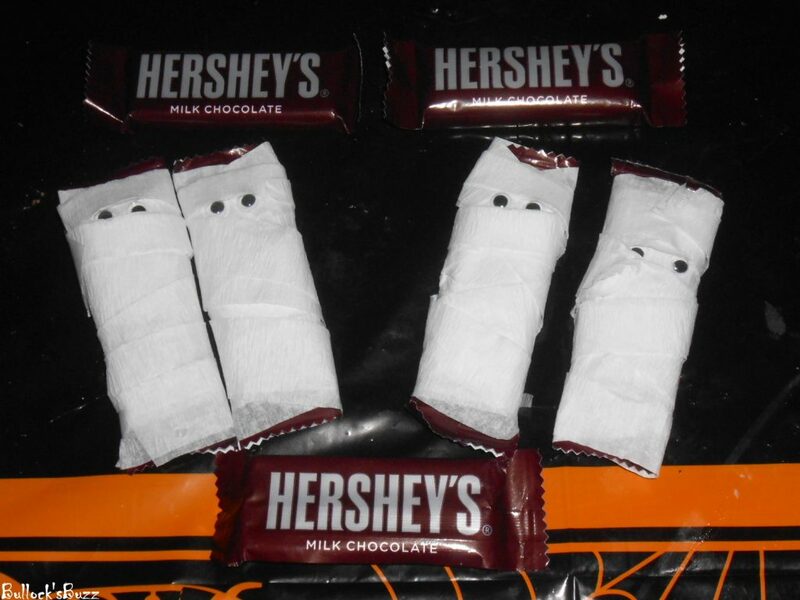 Halloween is only 10 days away, so make this year the sweetest and spookiest one yet, and stock up on Hershey’s candy! 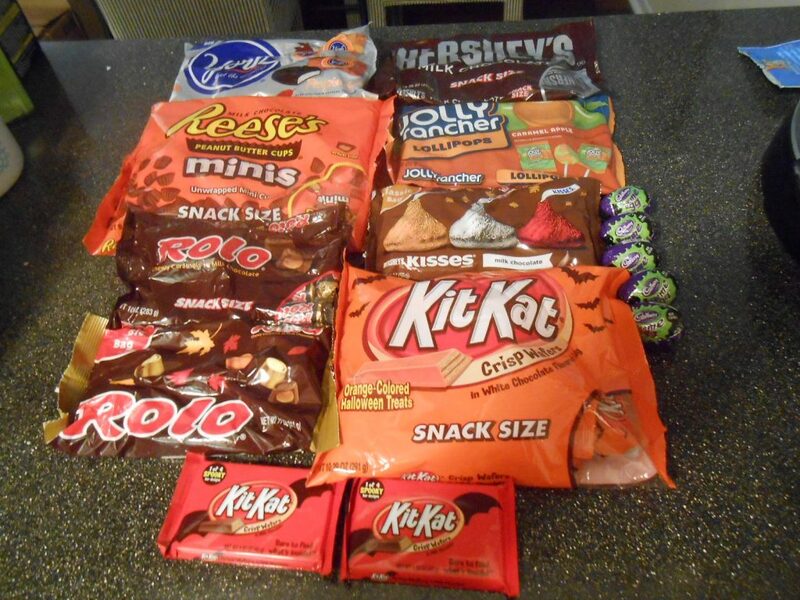 Do you see any of your favorite Hershey’s treats?